We have an ever growing population of birds. We raise Rhode Island Reds for the eggs, Cornish for meat, turkeys for feasts, ducks for entertainment and Guinneas for insect control. Our herd of Scottish Highland Beef Cattle continues to grow in number. Several mothering cows keep us busy through the Spring and Summer season. 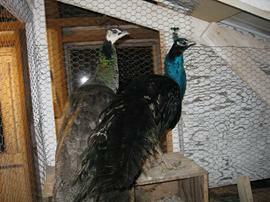 A pair of peacocks have made an entertaining addition to our aviary. 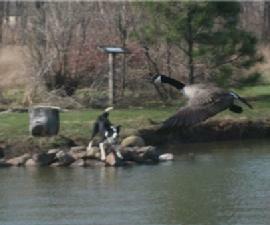 We are a resting place for a few Canadian Geese who take pleasure in keeping Edward, the Border Collie, busy. Jaocb feeds the meat chickens in the farm field. 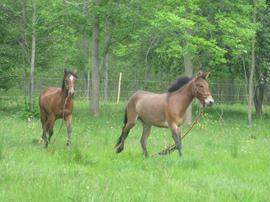 Anna, 3 yr old mule & brother Mickey, 2 yr old stallion soon to be a gelding. Morning sunrise on the farm.